Electronics Basics: What Is a Semiconductor? Semiconductors are used extensively in electronic circuits. 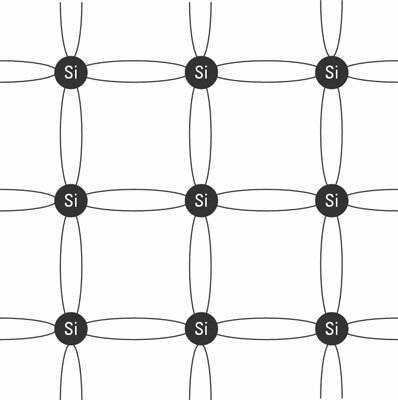 As its name implies, a semiconductor is a material that conducts current, but only partly. The conductivity of a semiconductor is somewhere between that of an insulator, which has almost no conductivity, and a conductor, which has almost full conductivity. Most semiconductors are crystals made of certain materials, most commonly silicon. To understand how semiconductors work, you must first understand a little about how electrons are organized in an atom. The electrons in an atom are organized in layers. These layers are called shells. The outermost shell is called the valence shell. The electrons in this shell are the ones that form bonds with neighboring atoms. Such bonds are called covalent bonds. Most conductors have just one electron in the valence shell. Semiconductors, on the other hand, typically have four electrons in their valence shell. If all the neighboring atoms are of the same type, it’s possible for all the valence electrons to bind with valence electrons from other atoms. When that happens, the atoms arrange themselves into structures called crystals. Semiconductors are made out of such crystals, usually silicon crystals. Here, each circle represents a silicon atom, and the lines between the atoms represent the shared electrons. Each of the four valence electrons in each silicon atom is shared with one neighboring silicon atom. 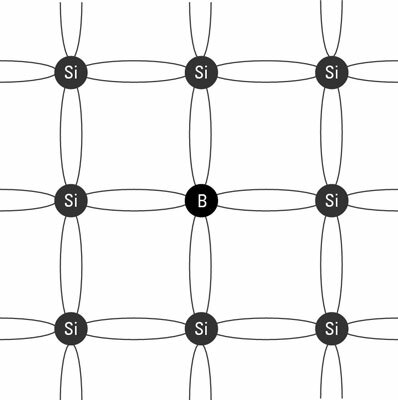 Thus, each silicon atom is bonded with four other silicon atoms. Pure silicon crystals are not all that useful electronically. But if you introduce small amounts of other elements into a crystal, the crystal starts to conduct in an interesting way. N-type semiconductor: Created when the dopant is an element that has five electrons in its valence layer. Phosphorus is commonly used for this purpose. The phosphorus atoms join right in the crystal structure of the silicon, each one bonding with four adjacent silicon atoms just like a silicon atom would. Because the phosphorus atom has five electrons in its valence shell, but only four of them are bonded to adjacent atoms, the fifth valence electron is left hanging out with nothing to bond to. The extra valence electrons in the phosphorous atoms start to behave like the single valence electrons in a regular conductor such as copper. They are free to move about. Because this type of semiconductor has extra electrons, it’s called an N-type semiconductor. 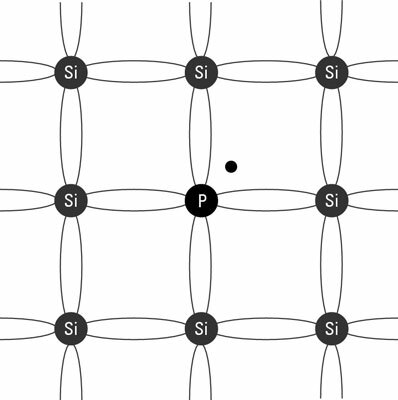 P-type semiconductor: Happens when the dopant (such as boron) has only three electrons in the valence shell. When a small amount is incorporated into the crystal, the atom is able to bond with four silicon atoms, but since it has only three electrons to offer, a hole is created. The hole behaves like a positive charge, so semiconductors doped in this way are called P-type semiconductors. Like a positive charge, holes attract electrons. But when an electron moves into a hole, the electron leaves a new hole at its previous location. Thus, in a P-type semiconductor, holes are constantly moving around within the crystal as electrons constantly try to fill them up. When voltage is applied to either an N-type or a P-type semiconductor, current flows, for the same reason that it flows in a regular conductor: The negative side of the voltage pushes electrons, and the positive side pulls them. The result is that the random electron and hole movement that’s always present in a semiconductor becomes organized in one direction, creating measurable electric current.